Join our industry experts as they provide 5 steps to better compete with digital Goliaths and build innovative, successful online brands. 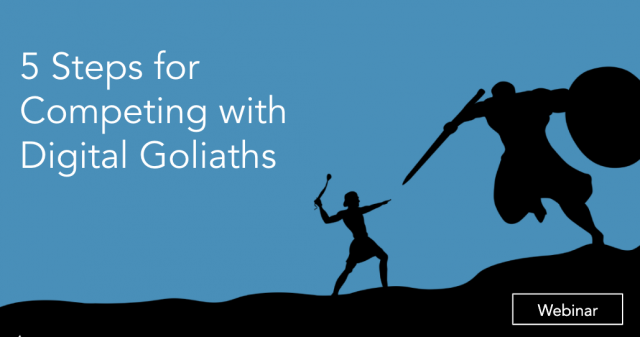 We’ll also share how Goliaths can defend their brands from upstart challengers to maintain and even grow their market position. Ashley’s career has been honed in search for over ten years. Starting out agency-side as the Head of Online Marketing at Coast Digital, then to BeatThatQuote.com (bought by Google in 2011) leading their in-house marketing team. At Google, Ashley led the marketing of the company’s finance and insurance comparison products across global markets. Kirk is the owner of ZATO, his PPC Marketing agency, and has been working in Paid Search since 2010, with a specific focus in Google/Bing Shopping Ads. In 2018, he was named the #12 Most Influential PPCer by PPC Hero. Kirk has published articles on Search Engine Land, Moz, PPC Hero, Wordstream and the Bing Ads blog, and has spoken at SMX, Hero Conferences, SLC Digital Marketing Conference and State of Search. To receive the video, please complete the form above.